You can see from our GPS track that it was another long sail, but what you cannot see from the GPS track is that this was our first less than comfortable sail. We had a beautiful send-off from the Isles of Shoals at sunrise and I took the first 4-hour shift at the tiller. 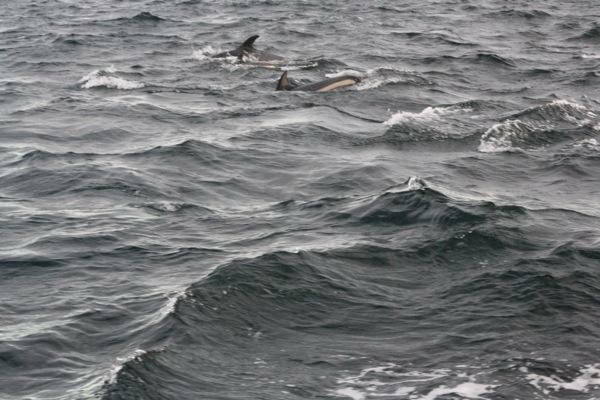 I woke Brian at 7:00am to view migrating dolphins and finback whales. 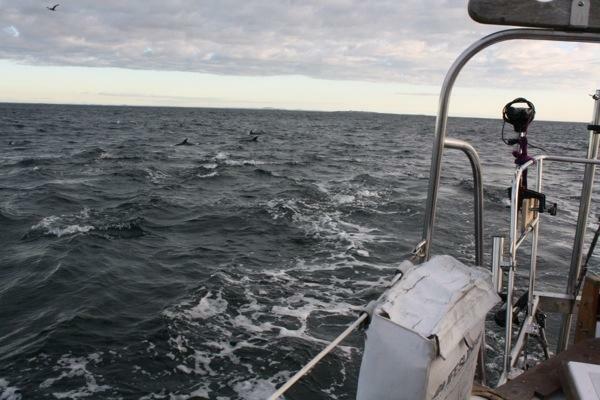 We sailed right through the dolphin pod and they were speeding along in our wake. Brian joined me for breakfast in the cockpit while we listened to the Morning Buzz, local NH radio, for our commuting enjoyment. We were thrilled to spend this Monday morning coasting through the ocean, no traffic here! 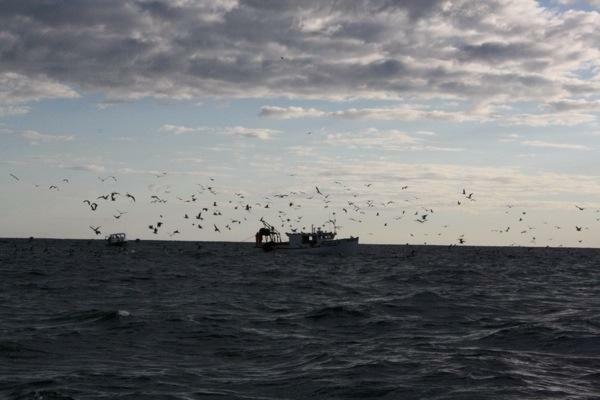 We passed very few other boats the entire trip, but the NH fishermen were hard at work. Our wind built in all day, as did the waves. Around 5:00pm with 15-20knt winds and building, we put the first reef in the main sail. Brian tried to capture the 5-10ft waves, but our photo doesn’t do them justice. Reefing the sail went smoothly and yes, this time I was wearing my harness. 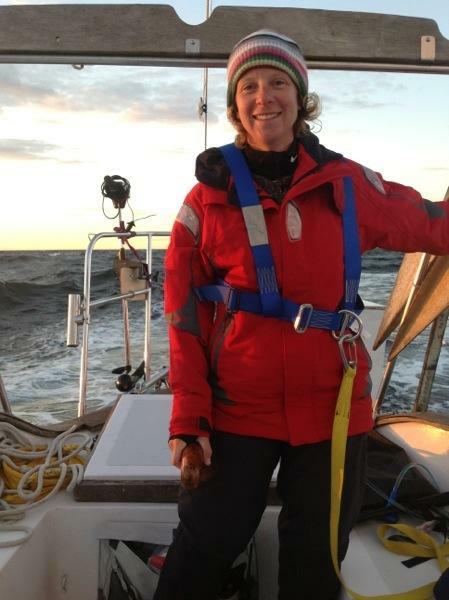 We have been using the harnesses while sailing in the dark; I am not a fan because it trips me up but I realize it’s necessary so that if either of us were to go overboard we wouldn’t be lost at sea. I was actually happy to be harnessed to the deck while tying the reef points since the boat was heeled into the water and the boom was hanging just out of reach. Brian’s steering in these situations is key to completing this task! 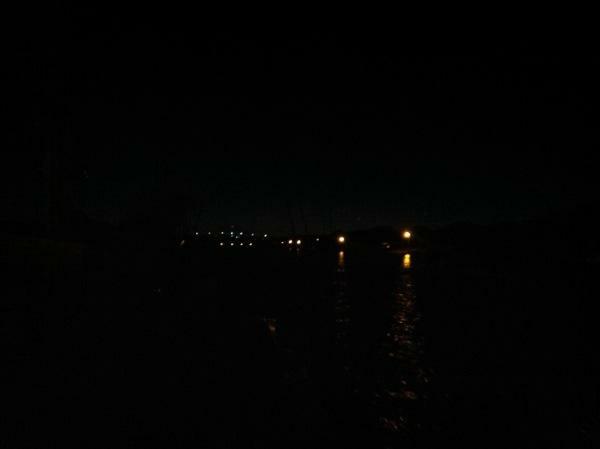 Around 8:00pm we entered the Cape Cod Canal. We took down the genoa just prior to navigating into the canal, and left up the main while we motored through. The canal is lit on both sides the entire way through; yellow street lamps to starboard, white street lamps to port. It was actually quite easy to motor through and we only passed two other boats. At the exit, there is a field of blinking lights; red and green buoys that light up like a landing strip to guide boats through the channel into Buzzard’s Bay. We set sail once again and I took the tiller. It was DARK! During our first overnight to Portsmouth there was a beautiful full moon to light the way. No such luck tonight, but the stars were amazingly bright in the darkness. Buzzard’s Bay was confusing because outside of the clearly marked shipping lane there were various blinking lights that did not correspond to the chart. I was able to find the charted buoys, but the additional red, green, and yellow lights were unnerving. The 20-25knt winds kept blowing full steam and the ocean was rocking. 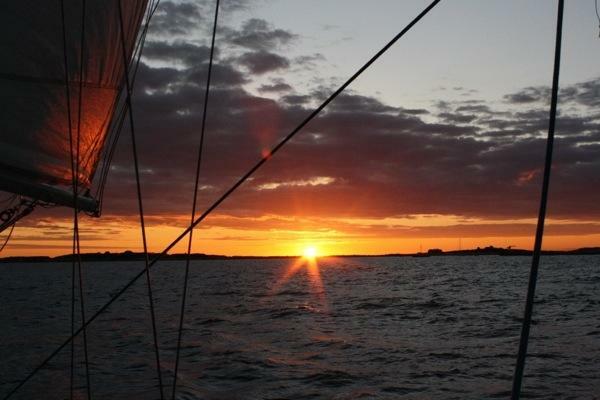 At about midnight, we put the second reef in the main sail. Working on the deck in the dark with waves splashing everything…PHEW! Brian steered magnificently and again a successful reef. Thank goodness we’d installed the reefing lines so they were all ready to go! We also took down the genoa, which did not cooperate as usual and I had to go up onto the bowsprit to pull it down. (hmmm…downhaul project, back on the list!) Once the genoa was down and secure up went the stay sail. Brian took the tiller until 4:00am. On my final watch, nearing Newport – WAIT! Weren’t we sailing to Mystic, CT?? Well, during our trip we received an email from our friends on Por Dos and learned they were in Newport. Rather than pass by this opportunity to visit, we decided to take a detour. We’d like to spend some time chatting with Mark & Marta about our southbound plans. Ours are still hazy and we’d like to compare notes on our thoughts about traveling outside of the Intracoastal Waterway and learn Mark & Marta’s experiences at sea, just in case we brave a trip to Bermuda. Anyway, final watch was hairy. The wind was whipping and we were farther offshore than anticipated. It was difficult to hold a course and the boat was being pushed farther out, so I woke Brian just as light was peeking over the horizon around 5:00am. We were unable to tack, so Brian decided to motor and I took the sails down. 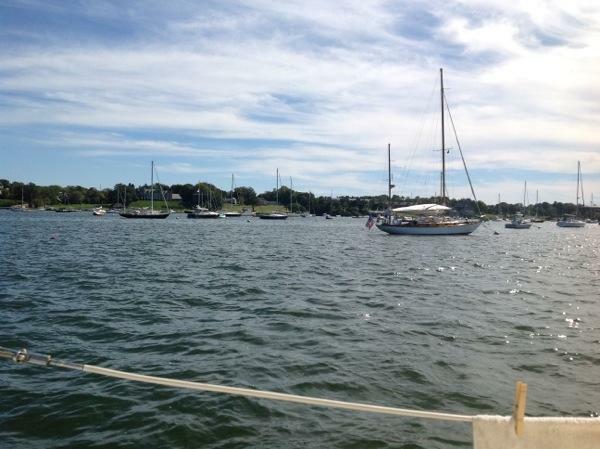 We motored into Newport Harbor. It’s boat show week (Thurs-Sun) so we are fortunate to have arrived early as the harbor will continue to crowd. We saw several boats who were here during our last visit, and then anchored just near Por Dos who had a nice roomy spot just ahead. We tidied the deck, logged our engine hours & distance, got out of our foul weather gear, and made ourselves cozy on the bunks with the heat on to dry out our gear while we got some sleep for a few hours. I loved the pictures! Dolphins are watching out for you! I am also soooooo happy for the harnesses! Stay safe! I love you like craaaazzzzzzzy! Welcome back to Newport Stephanie & Brian…We’ll be around on Sunday, but not Saturday. Loved your log and the dolphins…how great is that to see so up close and personal! We had a great visit with some fellow cruisers while here and completed several “around the house” projects that have been on our to do list for a while. We are setting out early Sat morning for a good weather window to the Deleware Bay. Hope you have a good weekend!